About four years ago, a friend bought a Bandai 1/15th scale Tiger 1, asking me to build it for him and to place it in a simple diorama with a few figures. It was interesting that twenty years previous I had been told of this kit by a friend and colleague at my local model club, and even though it was shown in the old Bandai catalogue, I never did manage to get hold of one myself. So you can imagine how pleased I was to finally get the chance to build the kit and see what it was really like. After finishing the model, I then attempted to get hold of a kit for myself, but to my disappointment they seemed to have disappeared. 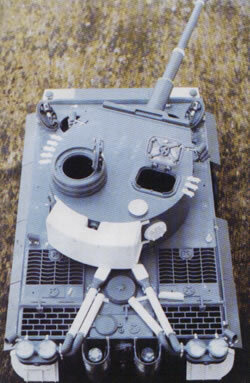 Then, about eighteen months ago I got the chance to exchange one of my scratchbuilt models for a Bandai Tiger. I didn’t have to be asked a second time, in fact I grabbed it so quick I almost took his watch as well! 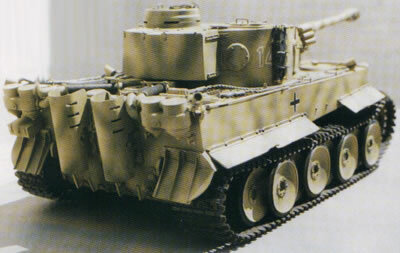 Having been bombarded with endless reviews and articles on the recently released large scale Tiger 1, it occurred to me that I could take an alternative look at the Bandai Tiger. 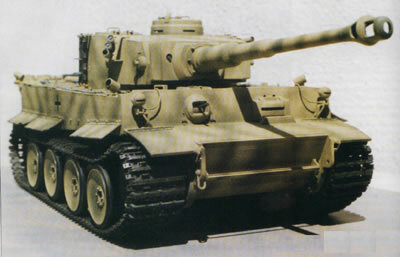 I’m sure that it’s a terrific model, but it strikes me that it is well over-priced for what it is and with me only needing a static model, I thought it might be time to take a look at this classic Tiger kit. The huge box sees the contents well protected and the sprues nicely laid out. Remembering that this kit is now very old, it’s immediately apparent that some of the parts require some improvement, but as with all models, it’s down to the individual how much is done. The wheels are all single pieces with separate rubber tyres. As it would be easy to confuse the parts, I decided to mark on the part numbers in pencil on the back of each part. The torsion bars are metal and slip through the lower hull and held with small coil loop springs that give the axles the tension. 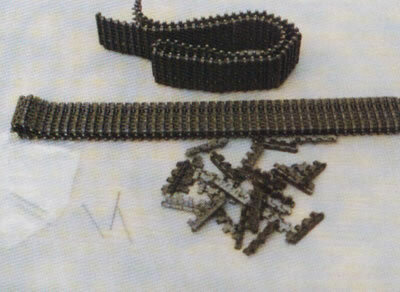 The sprockets are also metal, held to the ends of the axle with small bolts and covered with poly caps. The rest of the model assembles in normal fashion with no snags to speak of. Although a lot of the parts are simplified, they can be altered and improved as you go. The injection moulded tracks are fitted together with metal pins and once you get yourself into a routine, are quite easy to assemble. Some of the smaller parts, such as the headlight fittings on the top plate and the moulded conduit and small rosette are very basic. There are a few holes on the hull sides which take the brackets for the track changing cable, but they’re far too big. I found it a lot easier to fill the holes, drill new ones and construct new brackets. All over the model there are over-sized holes for the various tools and pieces of equipment, again it’s better to fill them and start again. 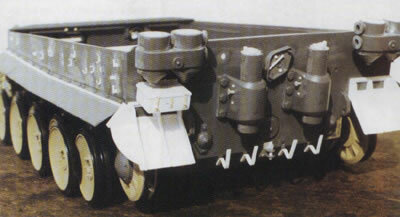 The rear turret stowage bin seems to be about standard for the model, but has no hinge or clasp detail. On a model of this size it would certainly be noticed, as would the lack of detailing on the front mudguards, which only have basic details, so additional detailing would be added using plasticard and rod. I guess that overall the model can only be described as ‘simplified’, but when you consider the price of the model compared to the latest Tamiya kit and the fact the Bandai kit is over thirty years old, I think it’s very good value for money. Another thing that came to mind while building the model was that with very few modifications, such as to the road wheels, cupola and other smaller items, you could build a late model. I had decided to build my model as a vehicle from the 501st Heavy Tank Battalion, referring to Achtung Panzer for the specific detail changes needed to the model. Work began with the obvious changes, including new rear mudguards constructed from 30 thou plasticard and 1/8th x 40 thou strip. New, narrower front guards were cut from 20 thou card with chequer plate plasticard on top with bolt and hinge details added from rod and strip. As I had settled on an early model, the dust guards were separated and pieces of .100 x 30 thou strip were added along their length. They were then fitted to the body with a bend halfway along the length. Bolt heads were added to the lower front hull behind the drive housings. On the top plate, strip was added for the mine launchers, using 2mm hexagonal rod for the bolt heads. The tools were re-arranged and a new pair of wire cutters were constructed as the detail was really quite poor. The main tow cables were fitted the opposite way round and new end clips made and fitted. Headlamp blanking plates were made and new brackets were built from 80 x 30 thou strip and fitted to the front plate above the mudguards. Copper wire was run from the two new lamp rosettes on the body to the brackets. I did use the original headlamps provided in the kit, but they needed detailing and if I had a better set I would have used them as the original items aren’t too good. The ‘V’ shaped fork for the Feifel air cleaner tubes was raised up slightly and the tubes made from 5/16″ plastic tubing, covered with a fine net curtain to create the texture. The smaller rear shaped tubes were fitted with square plates and bolt heads, also brackets were made for the four main boxes at the rear. The hull rear plate was fitted with a new towing pintle and tool box, constructed from 30 thou plasticard and strip. Brackets were made for the jack, but the jack itself was left off as it was pretty rough and not worthy of the kit. The intention is to either find a replacement or scratchbuild one at a later date. The exhaust stacks were fitted and topped with the earlier style pop-up caps, using small pieces of plasticard and bolt heads cut from plastic rod. Next came what turned out to be the most awkward job of the lot, cutting six slots into each of the exhaust shrouds. After much head scratching I finally did them with a razor saw, a thin knife blade, body putty and large amounts of swearing! The other unpleasant task was the removal of the raised centre piece on the gun mantlet to back date the model. Again the saw and knife were used to gradually remove the offending lump, which was covered over with 30 thou plasticard and yet more filler. 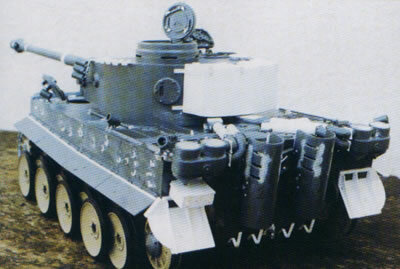 The rear stowage bin for the turret was covered with 30 thou plasticard to give it the squarer appearance of the earlier model. Side brackets were added from 1/8″ plastic channel with 40 thou bolt heads and the hinges were detailed with bolt heads and the clips made from thin strip and rod. 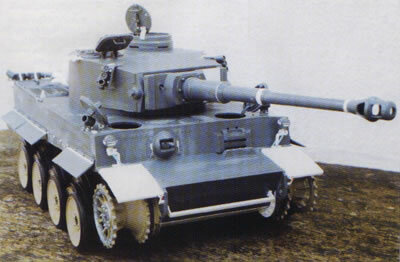 An extra pistol port was made from card laminated to the same thickness as the kit item and cone shaped bolts added, this and the kit part were then added to the turret sides. The smoke dischargers were assembled as per the instructions and fitted to the turret roof. Ignition wire was added using 1mm plastic rod and the thick main cable from 1/16″ rod. Work in progress : Birds eye shot The final job was to add the spare track link-brackets to the turret sides. I made the top ones from 1/8 x 20 thou strip and made the lifting handles from cut-through square tube. The bottom clips were fitted to the spare links and then the link fitted under the top bracket and glued in place. The last item, the turret brackets should cause a stir, because I’ve since been told by an expert (after I had made the brackets) that they were not fitted to this very early model, which is a bit of a shame because I certainly won’t remove them now the model’s finished. 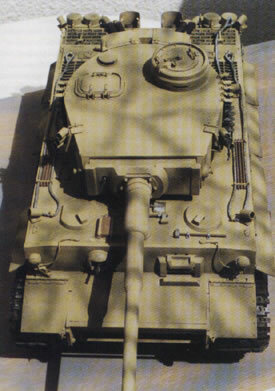 After checking a variety of reference sources I discovered that the colour scheme and markings for tank No. 142 varied tremendously. It could either be overall sand with numbers in red with white outlines, overall dark sand (almost brown) with white number outlines, overall green with white number outlines, or overall dark sand (almost brown) with white number outlines with an infill of sand. In the end I painted my model in sand with green disruptive pattern and white number outlines. No letters please, I know it’s probably not correct but at least I like it and I think the model looks good.